When I last wrote about my 6th great-grandmother Françoise Adam, I didn’t know very much about her. Her first husband Jean Bouché died in 1737. Françoise married my widowed 6th great-grandfather Jean Schmitt in Boulay, Moselle, Lorraine, France on 02 Sep 1739. The couple had at least three children. Shortly after the birth of her last child in 1745, Françoise died. A shaking leaf on Family Tree Maker offered information worth exploring. An Ancestry member posted that Françoise was born 19 Jan 1701 in Varize, Moselle, Lorraine, France. 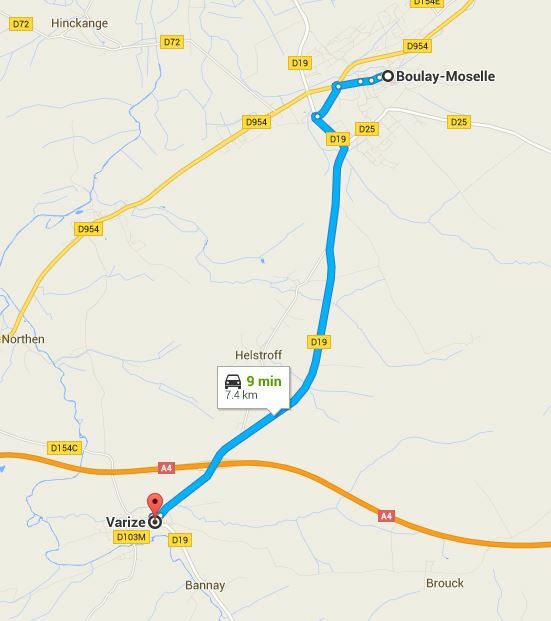 Google maps shows how close Varize is to Boulay where Françoise and Jean Schmitt were married. That shaky leaf clue was becoming more of a real lead for Françoise. I went to the free website of the Archives of Moselle to see if there were records for Varize. Score! Digital images are online from 1658 to 1792. I started with second book covering the years 1689-1710. 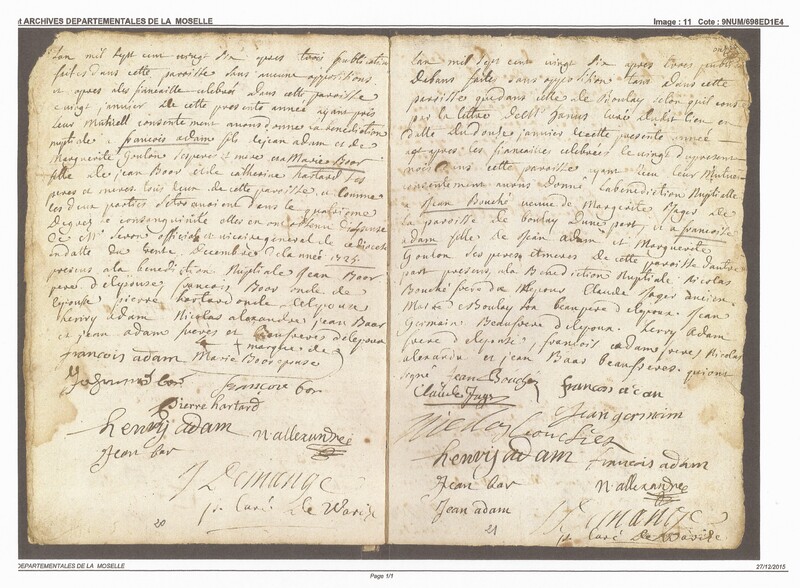 And on the 94th image – there it was – the 1701 baptismal record of a girl named Françoise, the daughter of Jean Adam and his wife Marguerite Goulan. These might be my 7th great-grandparents. Before I lept to any conclusions however, I needed something to prove my theory that this Françoise is my Françoise. The record for her marriage to Jean Schmitt wouldn’t help. Since they were both widowed, their marriage record references the couple’s late spouses rather than their parents. Françoise’s and Jean Bouché’s marriage record should name her parents. But when and where did this wedding take place? I knew the couple had at least two children, but my information was sketchy at best. Since marriages generally occurred in the bride’s hometown, I decided to stay in records for Varize. A daughter Marguerite died before 1730. That would be as good a starting point as any. Back to the Archives of Moselle. The book “9NUM/698ED1E4” includes the years 1725 to 1735. I started at page one, skimming all the records. The parish priest had thoughtfully underlined given names and surnames making my search an easy one. I saw several Adams and Bouchés, but none with “my”given names. Then it happened – the names seemed to leap off the 11th page: it was the marriage banns of Françoise Adam and Jean Bouché, naming each of their parents. And Françoise’s parents you ask? Jean Adam and his wife Marguerite Goulan – my newly found 7th great-grandparents! Woo hoo! 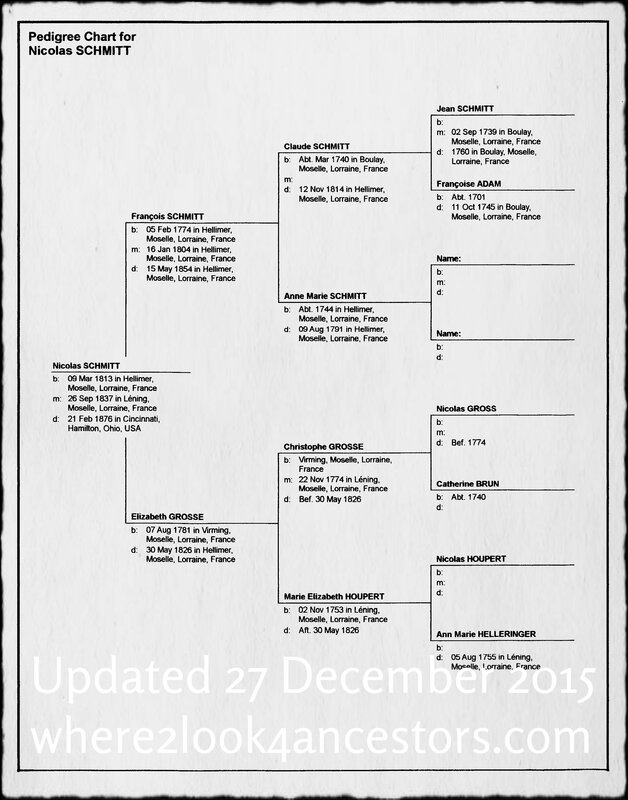 For the cousins trying to follow this branch of our family tree, I’ve included a pedigree chart below. Nicolas Schmitt (on the far left) is my great-great-great grandfather. His daughter Elizabeth married Jacob Koebe Mueller. Their son Alfred Jacob Mueller and his wife Ellen Gertrude Clarke had a son named Harold Clarke Mueller.